With the main gate forming a pivotal role in the access control strategy, considerable time was spent in the design of the area to support the security function. A team of architects and urban planners from Dennis Moss Partnership together with estate risk management professionals form Astrosec visited a number of estates in the Western Cape. The aim of the visits was to understand how the design of the main gate could support or undermine the security systems and procedures. Instead of building a small house with two sets of booms the design was created to support access control procedures and the security of the estate. The architects from Dennis Moss created a design to support every function, from the registration of contractors to searching of staff on exit. Not only does this increase the security of the estate but improve flow of traffic and the general experience of all who visit the estate. Every detail went into the design of this truly holistic security system. Everything from conduit size, to wheelchair accesses and the location of the ablutions for the security guards. The end result of the project was a hybrid design incorporating onsite systems and response, supported by off-site monitoring and disaster recovery. The perimeter security system will include an electrified fence supported by thermal cameras with embedded video analytics, monitored remotely. Biometric access control, lockout gates and full height turnstiles will control the access points of the estate. The security system will be connected on a dedicated fibre backbone with backup power generation. A single systems integrator will ensure quality and accountability throughout the lifespan of the system. The design allows for maximum security while keeping the amount of guards to a minimum and thus keeping the levy low over the long term. 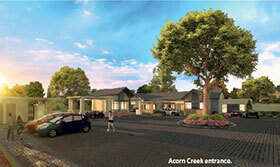 Acorn Creek will truly be an estate designed to be secure.